With interactive projectors popping up like mushrooms, there are suddenly plenty of cheaper alternatives to interactive whiteboards. If you're considering an interactive projector don't overlook the 3M Simply Interactive System. 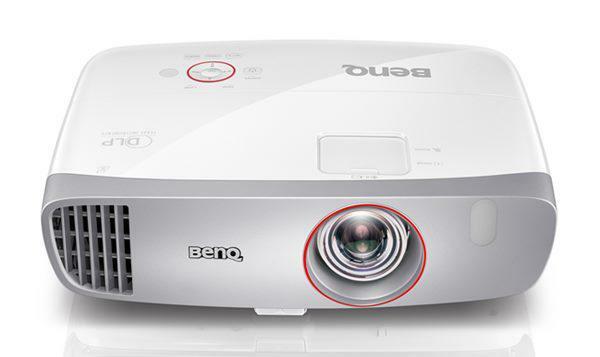 You can add it to a projector you already have or to a new projector, making any projector interactive for just $379 estimated street price. The name itself is a bit of a pun. The unit is a one trick pony: it's simply interactive. It's also a simple way to add interactivity -- with the possible exception of the suggested physical setup, which assumes that the projector is permanently installed on a ceiling or wall mount and normally involves adding an infrared camera to the projector mount. Aside from that, however, setup is almost as easy as plugging a new mouse into a computer. 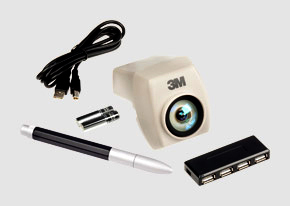 The Simply Interactive System consists essentially of the infrared camera, a battery powered stylus pen, and a USB cable to connect the camera to the same computer you're connecting your projector to. In addition, there's a USB memory key with the driver software on it, an assortment of hardware to let you add the camera to the projector mount, and, as a highly welcome extra, a 4-port powered USB hub in case you don't have enough free USB ports on your computer for the camera and USB key. For our tests, we skipped adding the camera to a projector mount and simply set it next to a projector on a desktop, an approach that works well enough, as long as you don't move the projector or camera after you calibrate the system. Note that setting up the projector this way opens the door to using the Simply Interactive System in a portable context, and 3M says that the IR camera is rugged enough to survive being carried around. However, 3M wisely doesn't recommend using it that way. More generally, the need to calibrate each time you set up the projector and camera puts this option in the category of possible, but better avoided, especially since there are other approaches to interactivity that don't require calibration. When you're giving a presentation in someone else's office, the last thing you need is yet another device that takes extra time to set up. The rest of the setup consisted primarily of putting the two included AAA batteries in the pen, plugging in the USB hub's power cord, and connecting the two supplied USB cables -- from camera to hub and from hub to computer. The two final steps were to launch the software and then run though a quick calibration routine, touching the pen to just nine points on the screen. One nice touch is that although you can copy the software to your hard disk before running it, you can also simply run it from the USB key. This can be particularly useful if multiple presenters are each using their own computers. To give each presenter the benefit of interactive control, you can simply pass the USB key along with the connecting cables from one presenter to the next. Alternatively, you can or plug both the USB key and the cable to the IR camera cable into the hub, and then pass the cable to the hub along. Note too that for a permanent installation, you only have to calibrate once unless you switch to another computer. After you've set it up, the Simply Interactive System works as promised. It's more than responsive enough for most mouse tasks like clicking (by touching the screen) and dragging. We found it a little sluggish for drawing in a paint program, but no worse than many interactive projectors. The package doesn't include any annotation software, but it should work with any program you like. Note too that the stylus requires contact with a solid surface. You'll need to avoid choices like painted wood on the one hand, where the pen could damage the paint, or rough surfaces like cinderblock on the other, where the surface can damage the pen. A (non-interactive) whiteboard would be ideal. Ultimately, if you're planning to buy a new projector, and you have a particular model in mind that isn't interactive, the Simply Interactive System is worth considering. In most cases, however, you'll want to start your search with models that already include interactivity. The real value of 3M's approach is that it gives you an alternative to replacing a projector you're otherwise happy with, just to add this one feature. What would be the street price without the projector? Kishore, what did Marc write that makes you think the $379 product includes a projector? what maximum size of screen is covered by this kit. Dose it respond as smooth as normal mouse as i have observed that freedom of drawing is not as smooth and accurate in current interactive projectors as compared to normal mouse. I'm trying this out with a non-3m projector. So far everything installs fine but my pen does not seem to be seen by the camera. Can you give me your setup exactly? How far the camera was from the screen. How far the projector was etc. What projector did you use. I actually figured out my question from before. I did not have the camera close enough to the wall. It is also important to note that the camera is angled downward at quite a steep angle. I found that the camera needs to be mounted about 1.5-3 ft from the wall for this to work. Also good to note that it will work with a standard projector though you will likely have to mount the two at different places to have a big wall for a projection screen with a standard projector. Also the shadows with a standard projector make viewing the image rather difficult.